I’ve talked in other posts about using what is “on hand” or available to teach. This time I thought I would take that more literally! Reading through Luke 7:36-50 I wondered how I might help the children remember how Jesus forgave The Sinful Woman who washed Jesus’ feet with her tears and dried them with her hair. Simon, the Pharisee, observed the woman and Jesus and began making judgements about them. Even though Simon didn’t say it outloud Jesus knew exactly what he was thinking and spoke to him. A great teaching on forgiveness was followed by Jesus forgiving the woman. Who was looking where? Simon was looking at the woman and Jesus. Jesus was looking at the woman and Simon. But what was the woman looking at? In her shame I think this woman was looking at FEET the entire time. And very special feet at that. What better way to relate to this woman than to help the children notice feet? 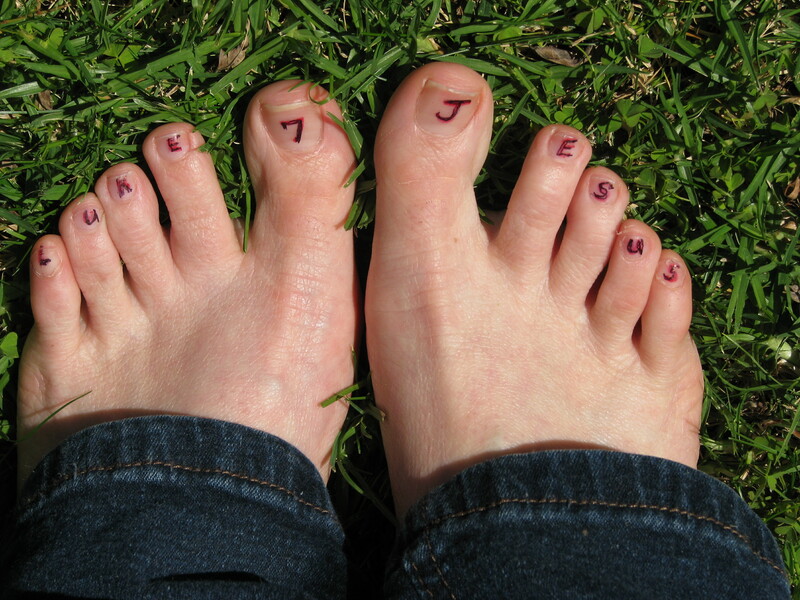 I decided to write L-U-K-E-7 on the left foot and J-E-S-U-S on the right. If you try this then I would suggest a fine point Sharpie pen and (those who know me well will appreciate this) anti-bacterial hand sanitiser! Be prepared for lots of giggles! Some might call it crazy. Some might call it gross. I call it good teaching and about the closest I get to washing disciples’ feet. Click here for more Teaching Ideas.